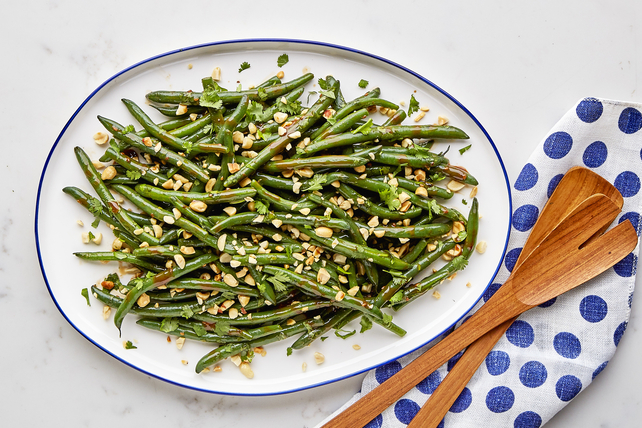 If you are looking for a quick and easy side dish, our Asian Fresh Green Bean Salad is just what you have been searching for. It has only 4 ingredients and it's ready in 30 minutes. How easy is that? Add beans to large pan of boiling water; cook 3 to 5 min. or until beans are crisp-tender and bright green in colour. Drain. Transfer beans immediately to bowl of ice water to stop the cooking process. Let stand until beans are completely cooled. Drain beans; pat dry. Place in large bowl. Add dressing and 3 Tbsp. cilantro; mix lightly. Top with nuts and remaining cilantro.